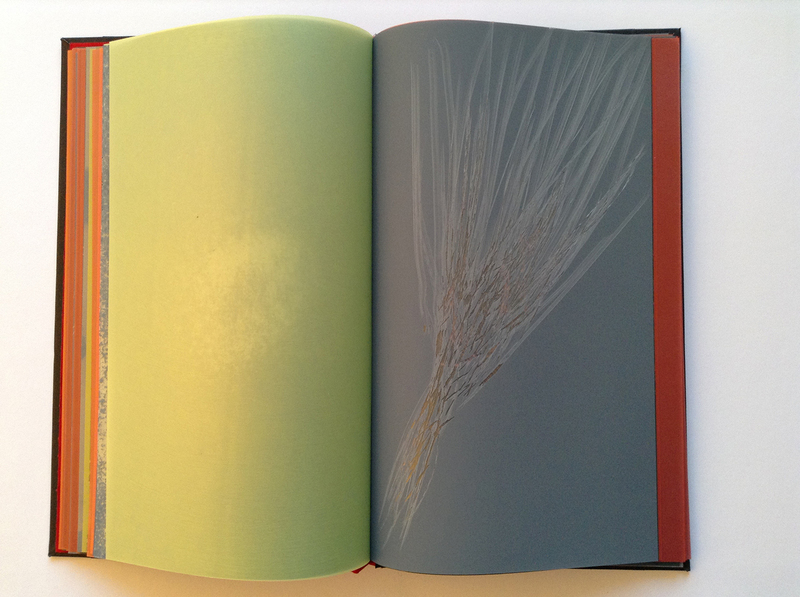 Spread from the book; left page is hand coloured frosted mylar that let the previous page’s image faintly be seen through; right page is hand sanded silicon carbide microfinsihing film, the erasures on the microfinishing film let the underlying page’s red-orange colour shine through. Spread from the book; left page is hand sanded chromium oxide microfinishing film; right page is hand sanded silicon carbide microfinishing film. Close up of a page, made of hand sanded silicon carbide microfinsihing film that let the underlying page’s light yellow colour shine through the erasures. Installation shot of the book in exhibition setting; the book is meant to be handled by the visitors. installation shot showing the book on the hand made book stand that is an integral part of the work. Bookstand: 12″ x 12″ clear plexiglass, laid on handmade, hand-polished steel columns made of rough discarded construction steel hand sanded and hand polished for seven hours to achieve its polished look. Bookstand is self supporting, the weight of the book keeps it steady. I am interested in the book as an object to critically examine its history, its making, its usage, its content and its value. The book as an artistic medium has the potential of giving the viewer a physical, immersive, embodied experience that goes beyond the object looked at. We have an innate, deeply rooted experience with books from childhood which suggests the viewers can approach this kind of work without barriers. My work, The Book of Hours, is a unique 120 page codex that expresses my personal values relating to labor. The pages of the books are hand sanded microfinishing films, chromium oxide or silicon carbide. These are microabrasives used in the high tech industry for polishing optical fiber. They are featherweight and have a deceptive silky surface but the particles attached to a clear film are extremely hard to erase. I attempted to erase the surface of the pages by sanding them with sandpaper or sanding cord until my fingers hurt or were bleeding. These hand sanded pages are sequenced with hand coloured frosted mylar that I coloured through a long, laborious process to create a uniform colour and shine. The various colours as they can be seen through the erasures of the microfinishing films create a variety of images as the viewer turn the pages and layer them on each other. The microfinishing film also changes colour depending on the amount of light coming through as the viewer turns the page. The green colour of the chromium oxide page turns completely black when held against light. The individual pages of the book are expressions of intense, manual labor; they are literally the imprints of my labouring body. The repetitive temporal structure of the codex and layered pages on the other hand speak of the time associated with work and labour. The sensuous silky surface of the pages contrasted with the prickly sensations of the erasures gives a variety of tactile experiences to the viewer throughout the book. The book has no title page, its cover is made of metal sheets to counterbalance the lightweight pages. The metal sheets are covered with book cloth tape and the book is assembled with meticulous care. In this work I transform contemporary, high tech industrial materials by both raw and skilled manual labor to express my appreciation to both kind of labour. I believe they are equally valuable and necessary both in life and in making art. The title of the book, The Book of Hours, has double meaning. They speak both of the hours of labour I invested in the work but it refers also to the medieval Book of Hours, as devotional book. I believe that labor, both raw and skilled labor, is a form of devotion and born out ofdiscipline. The bookstand is an integral part of the work. It is made of clear plexiglass and two pieces of rough construction steel that I hand sanded and hand polished for seven hours to achieve a smooth suface. The bookstand is self supporting, the weight of the book keeps it steady. It is a sculptural-architectural form, an edifice, that presents the book in a way that meets the viewer’s eye in an ideal angle inviting her to step close and engage with the work.